The eccentric Will (Tom Sturridge) hitchhikes across the country. Originally planned for Monument Valley, this sequence was shot in Echo Canyon -- located just up the highway from Park City, Utah. Irving and his camera crew used polarizers and grad ND filters to “pop” the dramatic skies as much as possible. Will’s “idealistic” world was photographed using Kodak film stocks to emphasize warm colors, whereas the “real world” scenes were shot with the more pastel color palette of Fuji filmstocks. The flashbacks to Will and Emma as children (above) were shot using Black ProMist filters in order to make the sequences more “glowy” and nostalgic. When Will meets up with Emma again (right), they take a long walk together at dusk that was actually filmed over four different days in four very different locations. This particular portion was shot in Ogden, while the other parts were filmed in Salt Lake City. The Twist House is part of the “real world” look of the movie, and is given a slightly cooler feel thanks to Fuji filmstocks (with a little greater emphasis on the blues and greens). In some cases, it was difficult to avoid the natural warmth of the Salt Lake City autumn, which was exploding with color all around. The treehouse was a custom build by the art department, courtesy of talented production designer Chris DeMuri. It became quite the hit with the local neighborhood kids! 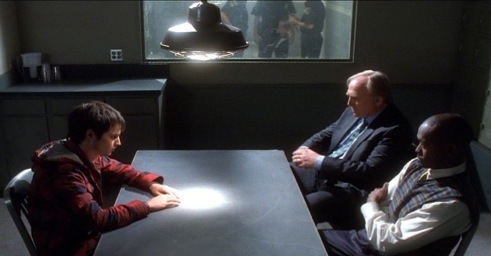 Will gets into a jam and is interrogated by the police. The detective on the far side of the table is played by director James Keach. Black ProMist filters were used along with several stops of overexposure to achieve the “blooming” look of the bright areas, while keeping the shadowy parts of the frame suitably dark. Emma (Rachel Bilson) visits home while Will (Tom Sturridge) travels to reach her. Due to the tight shooting schedule and the ever-shortening hours of daylight in the Salt Lake City autumn, the crew ended up shooting a good deal of interiors night-for-day. These are three examples (above, right, and below) where Irving and his crew had to do just that... they turned night into day with strategic shafts of light in just the right places.